Good feedback is kind, thorough and timely. It’s professional and focused. It leaves the writer feeling challenged to do better but great about their strengths. Even if that just means the location they chose was cool. Give your feedback relative to the skill set of the writer. Never lie or obfuscate. Just serve it up gently. An upset writer isn’t going to hear your points anyway. But an encouraged one will. Trust me on this. Active and Passive voice are used in different types of writing for different types of effects and sentence structure. Paying attention to the voice you’re using can massively alter the way your message is received. Let’s start with the basics. Active voice is when the grammatical subject of the sentence is performing the action. Let’s say you saw your friend Jill throw a ball. 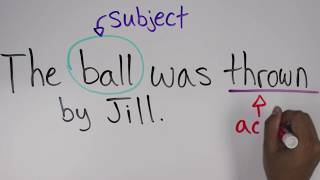 You could say “Jill threw the ball.” Here, the grammatical subject of the sentence, Jill, performs the action described by the verb “throw”. This is an example of Active voice. Passive voice is used when the grammatical subject of the sentence is being acted upon by another object that may or may not be defined. Now, let’s try making the ball the grammatical subject of the sentence. The ball was thrown by Jill. Here, the thing acted upon is the subject of the sentence. This is an example of Passive voice. As you can see, both sentences make sense for their own specific situations and both are grammatically correct. In some disciplines, passive voice is often preferred. Some scientific disciplines prefer passive voice because it puts emphasis on what was done rather than who did it. For example, one could say “Humidity levels were measured every 4 hours.” In this situation, it doesn’t really matter who did the measuring, so we leave the actor out of the sentence. Here’s another example of the benefit of passive voice: “Evans Library was built in 1968.” In this case, the subject is being emphasized rather than the actor, which is not relevant to the purpose of the sentence, and is left out. If both are correct, how do you know which one to use? You may have heard that you should use active voice—there is a common misconception that active voice is always the preferred option, and should be used whenever possible; however, while active voice can be more direct, both styles can be useful depending on your situation. For instance, “Miguel’s phone was stolen.” If the actor performing the action is irrelevant or unknown, you can use passive voice to put emphasis on the thing acted upon. We don’t know who committed the action, so we use passive voice to either leave the actor for the end of the sentence, or leave it out of the sentence completely. There are other situations that benefit from the use of active voice. For example, “Jason ate my pizza rolls.” If the actor performing the action is important and known, you can use active voice. If you were upset at Jason, you would want to make him the grammatical subject of the sentence. I know I would. Active voice is often a good choice for sentence structure, as passive voice can come off as verbose or wordy at times. Active voice can also be more concise and direct; however, that doesn’t mean it’s always the best choice. There are many situations where passive voice works just as well, or better than active voice, as it can shift emphasis away from the actor. Be careful that the style you use is appropriate and does not misplace emphasis. The overuse of passive voice can make sentences muddled and unclear. Here’s an example of excessive passive voice: “A recommendation was made by the professor that their textbooks be reviewed by the students before the exam, which has been scheduled for Friday by him.” That was a mouthful. As you can tell, the excessive passive voice becomes very distracting. Now let’s try using active voice: “The professor recommended that the students review their textbooks before the exam, which he has scheduled for Friday.” The active voice version was much more direct and clear, making it sound more natural. There is not a clear rule for which structure is more correct. Simply choose the structure preferred by your discipline that best fits the focus and intention of the sentence, accounting for the relevant subject, the clarity of the sentence, the context of the writing, and the preferences of your instructor. And the best way to learn is through practice. If you’re a Texas A&M student and you ever need help, make an appointment with the University Writing Center and we’ll help you out however we can.